Brazil, one of the largest countries in the world is also referred to as Southern America. The former colony of Portuguese for about 300 years is marked by remarkable wetlands, tropical forest, amazons, rain-forest, wildlife, waterfalls and beaches which all account for its beauty and makes it a great choice for tourist attractions. Additionally, this country has in it, the famous dreaded Snake Island. Some of the other places of interest include, Campos de Jordao, Lencois Maranhenses National Park, Pantanal, Copacabana in Rio de Janerio, Amazon River, Ilha Grande and the Christ the Redeemer in Rio de Janerio to mention but a few. Brazil also harbours one of the most dangerous, untouched wildlife reserves, an island with the deadliest and most dreaded snakes that strike on sight – the Ilha De Queimada. How did Iiha De Queimada become known as Snake Island? History has it that there was a time the sea levels increased and caused some part of the land to detach from the coast mainland, thereby, causing some snakes to become stranded. This happened around the year 1909, 11,000 years ago. Another account states that snakes flooded the island as a result of the voluntary fire in the forest which is sometimes done to depopulate the forest of wildlife and clear the land for plantation purposes. This fire was first recorded in 1925 and in 2005, an experimental outcome of military trajectory also set off fire on the Island, these activities are believed to have given rise to the effect of deforestation and led to the land shift. This snake island is said to be populated by a slithering mass of 400,000 snakes. Also, recent records by scientists show that the habitat is a home to about 2,000 to 4,000 Golden Lance-head pit vipers, which are highly venomous. These snakes have survived by feeding on two major species (Troglodytes musculus and the Elaenia Chilensis) out of about 42 migratory birds that land on the island and a few available land creeping preys like the scorpion, amphibians, lizards, other smaller snakes retained on the island after the land shift. The Ilha de Queimada, also known as Snake Island is located about 21 miles off the Sao Paulo coastal state, measuring about 43 hectares and 206 metres (676 feet) above sea level. It is a beautiful scene to behold, the island has a temperate climate, slippery landed slabs, with flat rocky cliffs, and craggy mountains. It is a beauty to behold from afar as the name of this island drives in uncertainty and dread into the hearts of people, especially the ‘Ophidiophobia’. 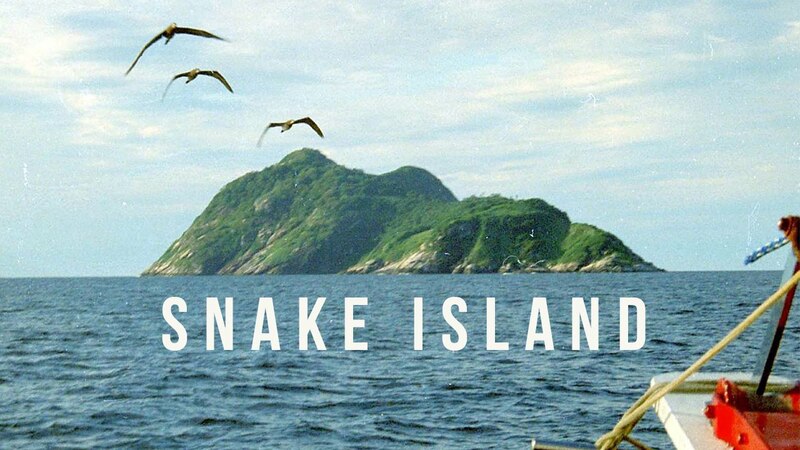 Entering into this island has been highly prohibited by the Brazilian Navy in a bid to preserve the snakes whom they believe are endangered species except for occasional permit granted to scientists, explorers and researchers. Mostly highly venomous species of snakes are found here, they have developed adaptations to help them survive. They are considered as semi-arboreal in nature which may have to do with their need to capture and kill their winged preys for food. The snakes are said to have a good number of hermaphrodite, male and female. They are mostly yellow mustard to off white in colors and blend perfectly with the environment. Some of them include the Golden Lance-head, pit-vipers with scientific names Bothrops Insularis, Bothrops Asper, Bothrops Jararaca, the Dipsas albifrons non- venomous snakes. It’s widely believed that every step per meter measurement, there are about 3 – 5 snakes within that radius, a tale that is currently untrue as there has been a sure decline of these species as a result of the activities of poachers and hunger (death) as the two main birds they depend on for food are seasonal migratory birds. The Bothrops Spp are said to mate on the ground and on trees around the months of March, August and September during the raining season when there would be enough foods and their gestation period is abut six to eight months. They are believed to give birth viviparous because their fertilization is internal. The story of the hungry fisherman who wandered into the forest to pluck some banana to eat and walked on with reckless abandon until he was bitten by a snake on the tree branches and he was found dead, sprawled out in a pool of his own blood. The story of the last lighthouse keeper and his family who were attacked by fiery snakes after one slithered through an open window into the house and bit one the family members and in a bid to escape they ran out of the house, racing to where the escape boat was packed, then, a large number of snakes were said to have attacked and killed the man, his wife and three children. Though the myths are contested as not so true, it is after all a myth, stories need to be passed down to the younger generation. The record has it that the last lighthouse guard service ended in 1980 when the lighthouse guards were replaced with headlight equipment. The golden lance-heads, Bothrops Spps snakes have been attributed to 90% snake bite related deaths in Brazil. The venom acts fast and is recorded to be 3-5 times very potent and fatal if any human is envenomed by a lanceheads, between 0.5% – 3% if treated with anti-venom and 7% if untreated. A bite from any lancehead can result in any of the following; swelling around the bite point, local pain, nausea, in severe cases – vomiting, blood blisters, bruising, blood in the vomit and urine, intestinal bleeding, kidney failure, hemorrhage in the brain and severe necrosis of muscular tissues. Research has also revealed the use of the venom extracted from Bothrops jararaca in the manufacture of drugs such as ‘Captopril – a drug prescribed for blood pressure treatment. Truth is, the popularly dreaded island has in recent years received well over 5 to 8 visits from scientists who were more interested in research purposes than their fear of snake bites or safety. Every captured snake by the scientists had a micro chip inserted in the tail, after it has been extensively studied and findings recorded in facts sheets. Some of the items collected were the venom, sperm, scale and a lot more after which they are eventually released back to their niche in the habitat.